Apple And Walnut Bread recipe by Marium Hamid at PakiRecipes.com. 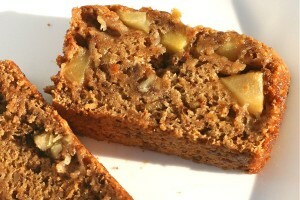 There are plenty of apples and nuts in this yummy fruit bread. It's great almost any time of the day. 1/2 cup walnut halved, chopped. Sift flour, baking powder and salt in a large bowl. Add sugar stir with a fork. Combine eggs, butter and juice in a small bowl. Add to the dry ingredients and using hand mixer; lightly mix in the egg mixture until just combined. Add apple and walnuts and gently stir to combine the ingredients. Spoon batter into prepared pan and bake for 45-50 minutes or until top is golden and tester inserted into center comes out clean. Thanks Atif for the corrections/updates. We have implemented them successfully. Corrections: 1 3/4 cups allpurpose flour, 1 1/2 teaspoons baking powder , 1/4 teaspoon salt , 3/4 cup sugar , 2 large eggs, beaten , 1/3 cup butter , melted , 3/4 cup orange juice , 2 medium apple pealed and grated , 1/2 cup walnut halved, chopped. Bake for 45 - 50 min.